Extremely exciting news for our club with the recent announcement that Coach Paul Telfer is taking over as Director of Coaching. Coach Telfer is in his second season as an assistant coach with the new NASL Indy Eleven Soccer team and lives in Carmel with his wife and two children. Telfer made over 300 league appearances in the English Premier League with Coventry City and Southampton and two season’s with Scottish powerhouse Celtic FC where he competed in Champions League play. Read Full Announcement Here I have had the pleasure of being around Coach Paul some on the soccer field and his thoughts and approach to the game have me really excited. With 20 years in Europe as a player and more as a coach for both professional teams and youth teams in Europe, Paul has forgotten more about soccer than I know. His attention to detail and a desire to develop our player’s fundamentals are what have me most thrilled. Keeping with the Carmel FC theme – that PLAYER DEVELOPMENT is more important than winning is one thing that I really think will help the club as we enter our 7th year. “If we can teach the kids at a young age to play the game properly, with good balance and good control that’s what will take our players and the club to the next level,” Coach Paul says. “We have to teach the fundamentals over and over and over again before we start worrying about winning or losing games.” I know that has always been my approach to coaching – winning is nice – but enjoying the sport and training players who can have a chance to make the High School teams and further their career in soccer has always been my measuring board. Having a DOC like Coach Paul, that will help cement that belief and assist us coaches and parents to better train and help our kids reach that goal, has me really excited! Indy 11 Asst Coach Paul Telfer becomes new DOC. 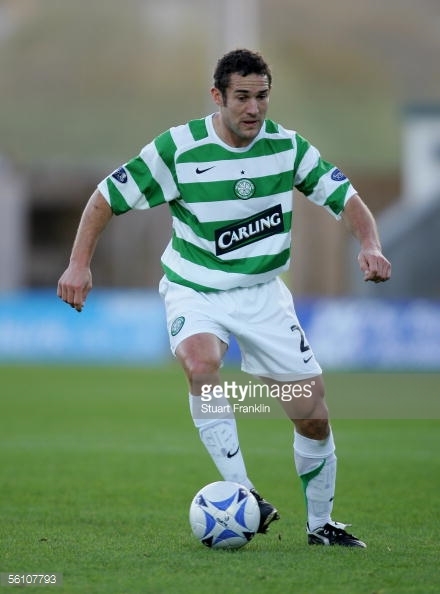 Here’s Paul Telfer playing for Celtic FC in a Champions League Game. A fabulous week in World Soccer News – my precious Juventus (the old lady of Italian football) is on to the Finals of The Champions League vs Barcelona on June 6th. Juve has one of the world’s best goalies ever in Gigi Buffon, one of the best central defenders ever in Chelini, and one of the better mids in Pirlo (now combined they are over 100 years old) but its great to see Juve pushing on to the finals for the first time in over a decade. Of course Barcelona with the World’s best player ever- Messi and a devastating frontline of Suarez, Messi and Neymar is going to be favored. But it’s a great run for Juve and you never know – great thing about world football! The Indy Eleven are back home Sat Night, May 16 vs Minnesota at 7:30 pm and its Carmel FC night at the Mike. There are still tickets available if you want to get your own and join us down there. A couple of our teams will play on the field at 5 pm Pre-game and then be in the fun zone at 6 pm. MLS Expansion Discussion who’s Next – where does Indy Stand? *The 12:30 kickoff is Steven Gerrard’s final game at Anfield before leaving Liverpool at the end of the season to join the Los Angeles Galaxy. These 2 battle for positioning in the top 4.